LaBa! aims to showcase artistic and musical expressions outside the usual spaces and conditions to reach out to new audiences. LaBa! is a platform that encourages artistic encounters, as well as intellectual and playful dialogues between artists and their audiences. For the 9th Edition of the LaBa! 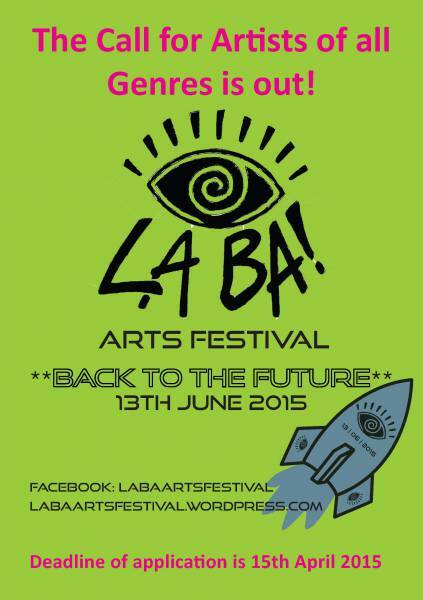 Arts Festival the theme is 'Back to the Future'. LaBa! invites artists of all disciplines to reflect on the question of the past, present and future, stimulating the imagination in a creative way. Fill out the form on the back and hand in all documents required. We will be glad if the proposal is related to the theme, the space (Bukoto Street) and/or the aim of the festival – 'Art is for everyone!'. There will be workshops, seminars and events leading up to the festival. Documents handed in as a soft copy (via e-mail) should be sent in common formats (pdf, jpg, mp3, mpeg, mp4). Hard copies should be handed in at the reception of GZK/ UGCS, Plot 52 Bukoto Street, Kamwokya, Monday to Friday 9am to 5pm. Deadline for Submission is Wednesday 15th April 2015. The selected participants will be informed by end of April 2015.